M. Bridget Duffy, M.D., is the Chief Medical Officer for Vocera. 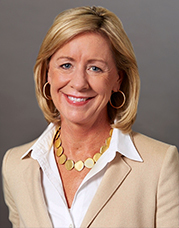 Prior to her appointment as CMO, Dr. Duffy co-founded and served as Chief Executive Officer of ExperiaHealth, a company with the mission to assist organizations in rapidly improving staff and patient loyalty through innovative technologies and solutions that restore the human connection in healthcare. ExperiaHealth was acquired by Vocera and now drives the company’s research collaborative as the Experience Innovation Network. Dr. Duffy was an early pioneer in the creation of hospitalist medicine and launched programs to accelerate clinical discovery in the field of Integrative and Heart-Brain medicine, helping establish the Earl and Doris Bakken Heart Brain Institute. She previously served as Chief Experience Officer (CXO) of the Cleveland Clinic – the first senior position of its kind in the nation – leading the institution in improving patient experience as its top strategic priority. Dr. Duffy is a frequent speaker on the subject of why patient, family and staff experience matters and how it impacts quality, safety and clinical outcomes. Dr. Duffy attended medical school at the University of Minnesota, and completed her residency in internal medicine at Abbott Northwestern Hospital in Minneapolis, Minnesota. She currently serves on the board of directors for Evolent Health, Inc. and on the advisory boards of Stanford MedicineX, Velano Vascular, Hygge Health, Maven Clinic and the Institute for Healthcare Excellence.